The more we involve AI in our daily lives, the more we need to be able to trust the decisions that autonomous systems make. However, it’s becoming harder and harder to understand how these systems arrive at their decisions. 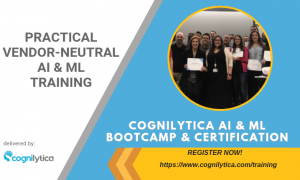 Cognilytica believes that Explainable AI (XAI) is an absolutely necessary part of making AI work practically in real-world business and mission-critical situations. Rather than trying to make neural networks explainable, simMachines proposes an alternative to neural network approaches (and other machine learning approaches) that is inherently explainable using a nearest-neighbor based similarity-based approach to machine learning.